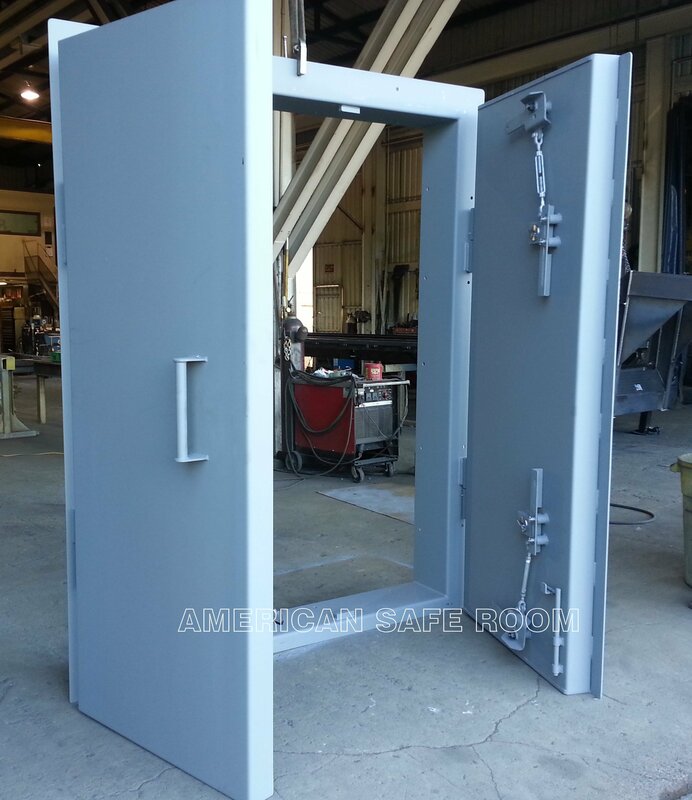 We design, engineer, and fabricate custom doors and hatches. Our engineering department has decades of experience and we have proven hardware designs that are scalable to any size. 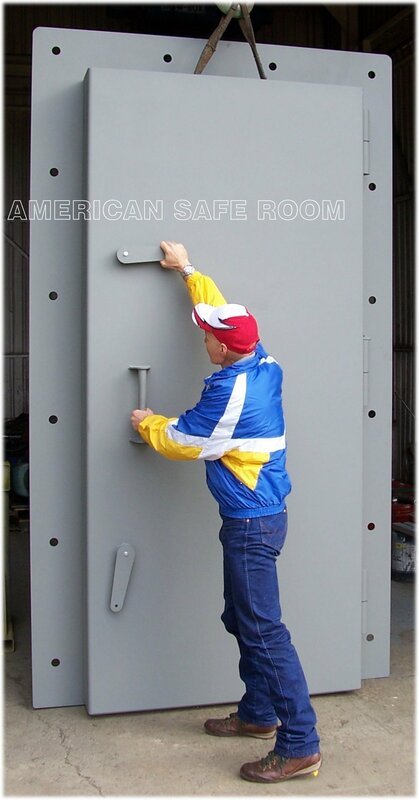 We've built blast doors that are 24 x 24 inches on up to 25 x 20 feet. 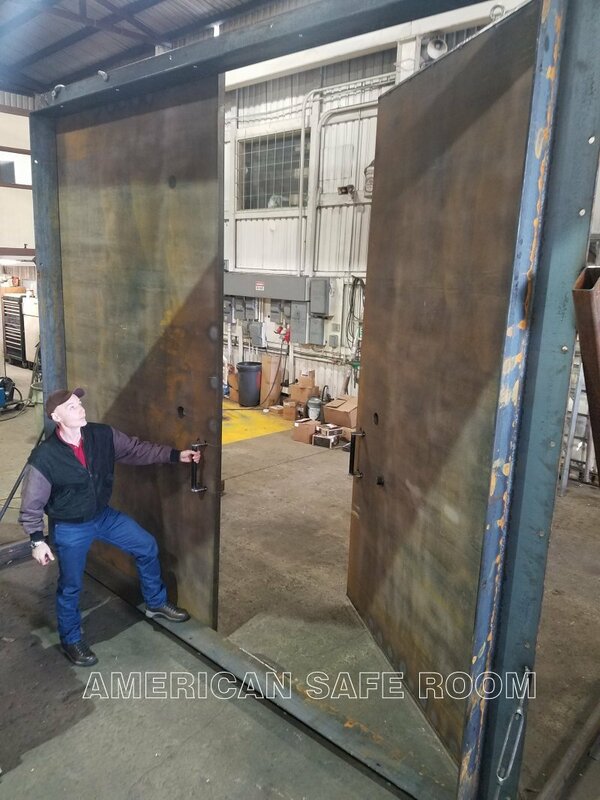 For blast resistant doors, we need to know the size and the blast load rating in peak pressure and duration or the impulse. We use the calculations in UFC 3-340-02, Structures to Resist the Effects of Accidental Explosions. The description for this document reads: This UFC 3-340-02 presents methods of design for protective construction used in facilities for development, testing, production, storage, maintenance, modification, inspection, demilitarization, and disposal of explosive materials. In so doing, it establishes design procedures and construction techniques whereby propagation of explosion (from one structure or part of a structure to another) or mass detonation can be prevented and personnel and valuable equipment can be protected. DoD projects and work for other customers where appropriate. 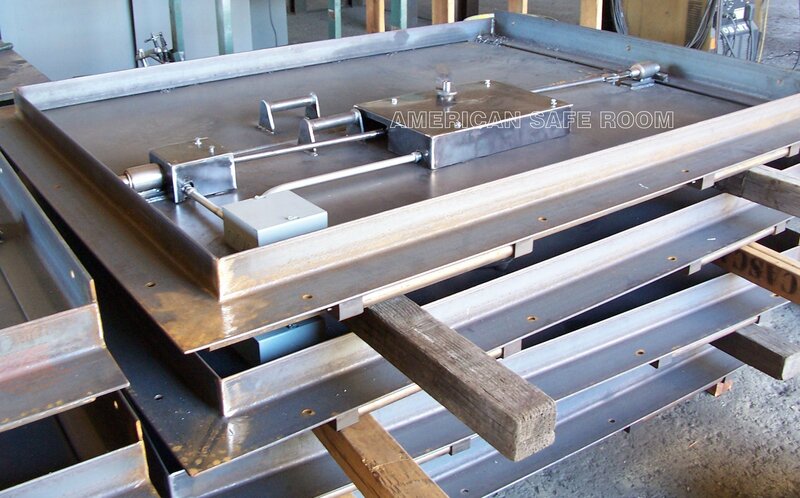 Solution: 0.375" plate steel doors with a 2 x 2 structural tubing frame holding the plate flat to ensure a proper seal. Angle section frames, high duty cycle bronze sleeve bearing hinges with grease zerks for ongoing lubrication. Rotating cam latches draw the door leaf into the frame, compressing the seal. In service since 2017. Solution: 4" concrete fill, .3125 thick skins. 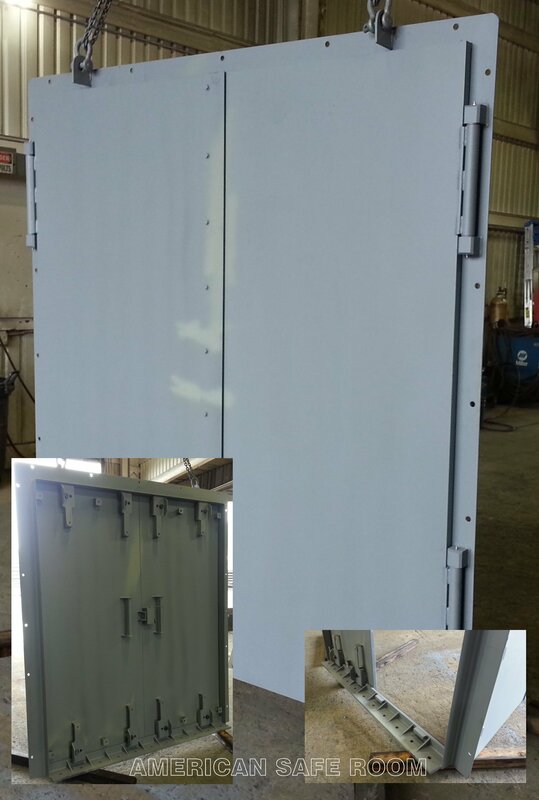 Heavy duty hinges, 9" x 4" frame angles, deadbolt locks, and outside cam latch operators. 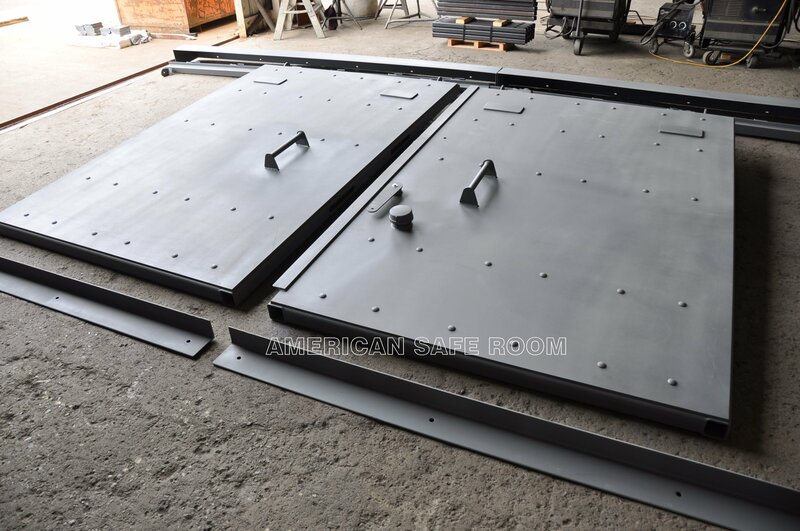 After filling with concrete, the door leaves weigh 3,100 pounds. In service since 2016. 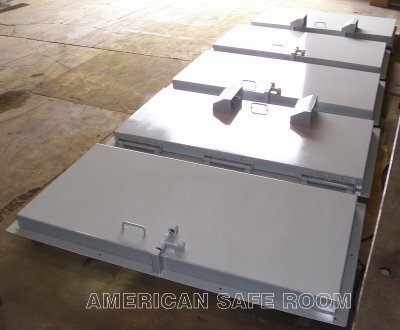 Solution: 4" concrete fill, .25 thick skins, 6" x 4" frame angles, rifle bolt style pin latches that extend down into embedded sockets. 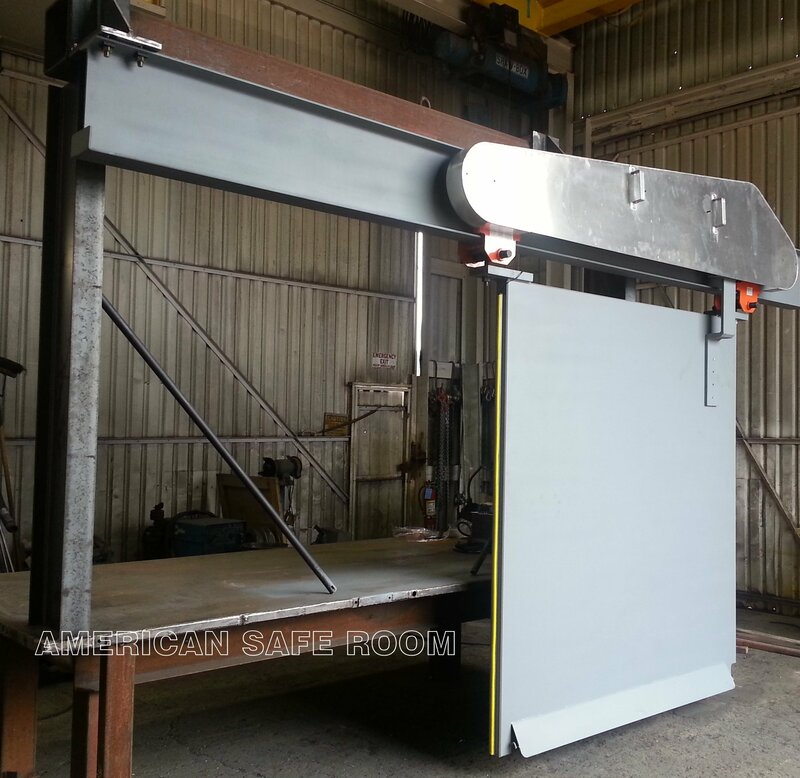 The open top frame allows a crucible to be moved through the doorway on an overhead crane. In service since 2012. 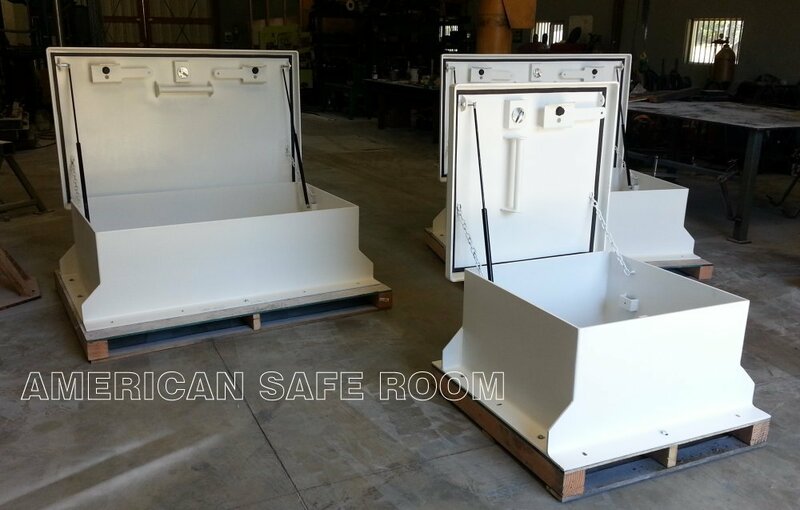 Solution: 2.375" concrete fill, .188 thick skins, 5" x 3" frame angles, custom solenoid latch assembly that interfaces with a safety lockout system. In service since 2013. 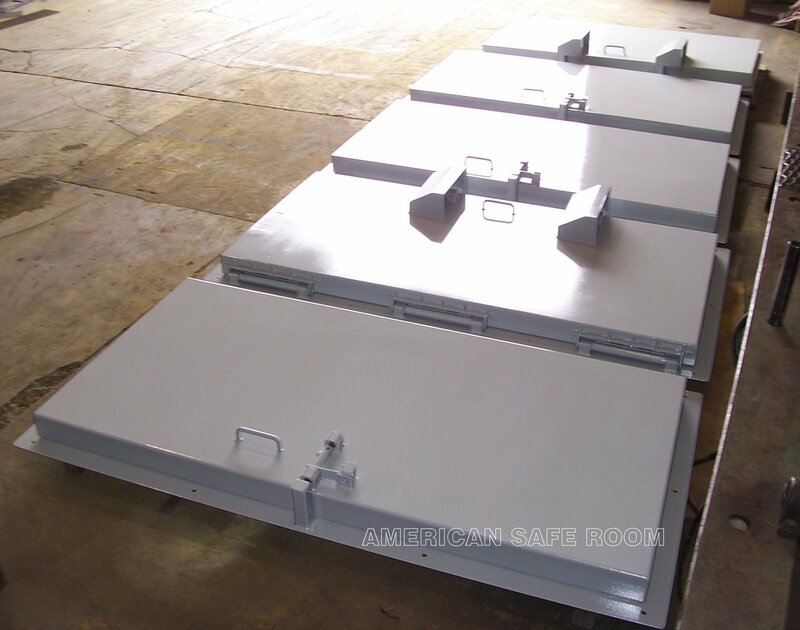 Solution: 3.125" thick steel plate, custom gear motor/chain drive system, mechanical blast locks on both the leading and trailing edges, leading edge safety switch, integration with electronic safety lockout system, and a drive release feature to open the door in the event of a power outage. In service since 2014. 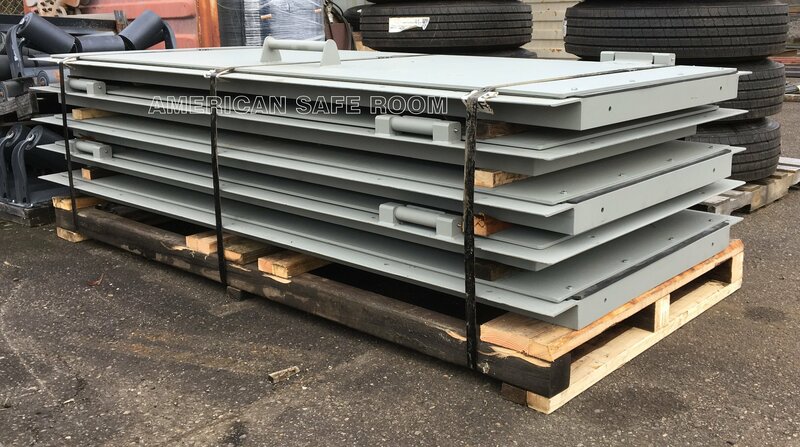 Solution: 8" concrete fill, .3125 thick skins, 12" x 8" frame angles, heavy duty hinges, fire rated door seal, internal steel reinforcement, outside latch operators. 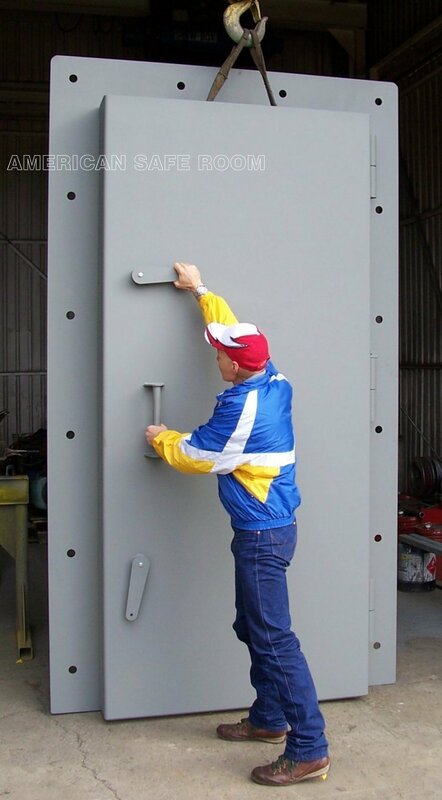 After filling with concrete, the door leaves weigh 6,780 pounds. In service since 2014. 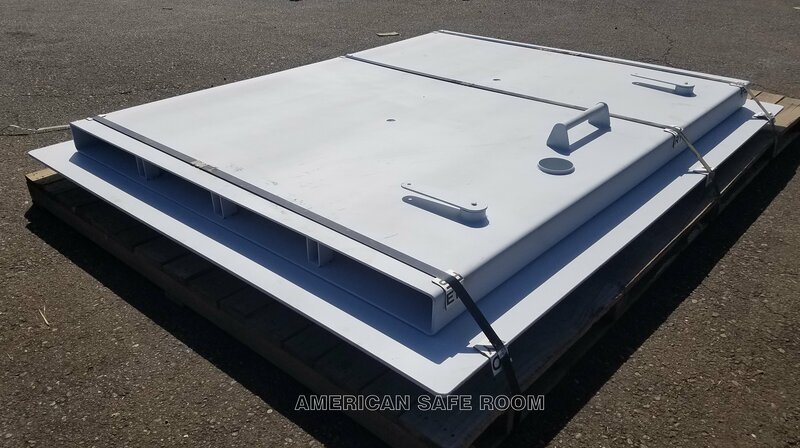 Specifications: 72" x 80" double leaf swinging blast door, 28 PSI peak pressure, 23.9 ms duration, 334.6 psi-ms impulse, no poured concrete threshold in the existing rough opening so a fabricated steel threshold had to be engineered. Solution: 1.25" thick 50ksi yield steel door leaves. Bottom threshold: 3/4” thick 50ksi yield steel 3” x 5” fabricated angle with 3/8” gussets on 6.5” centers with full penetration welds. Four rotating cam latches per leaf, each latch is rated for 14,816 pounds. UFC 3-340-02 calculations for the blast and rebound loads as well as anchor calculations were supplied with this door. In service since 2017. Note the 35 foot long telephone pole that weighs over 1,100 pounds is moving at 180 feet per second (122 MPH) and the nearly 4,000 pound automobile is moving at 194 feet per second (132 MPH). These missiles have far more energy than the standard FEMA storm door test of a 15 pound 2 x 4 board moving at 146 feet per second (100 MPH).